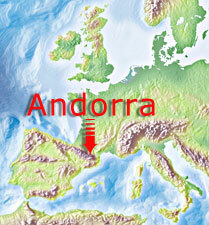 Andorra is a tiny principality nestling high in the Europe's second biggest mountain range, the Pyrenees. Andorra boasts a great snow record and unsurpassable sunshine, blue skies, good food and great wine! A dishevelled looking 'mob' from one of our CSIA spring courses! One day they might even become Ski Instructors. Oops! some of them are! Soldeu-El Tarter is the principal ski area in Andorra and over the last 35 years it has developed into one of the best known ski destinations in Europe. 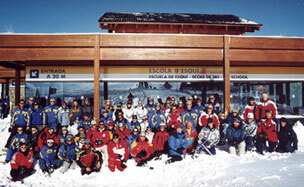 The multi languauge ski school is now famous and the English section is the largest in Europe! The Soldeu Ski School complex basks in the Mediterranean sunshine on a high plateau overlooking Soldeu village. Soldeu ski area was the start of skiing in Andorra as we know it. El Tarter area was then formed and linked. Then more recently Canillo was added providing diverse skiing, modern lifts and extensive snow making. Things are changing now, big time! Check out the graphic below... that is GRANDVALIRA!! You can see the difference now with over 200 kms of pistes! Over 6.5 metres of snow fell last season! Pas de la Casa and France on the left with the old road snaking over the Pass of Envalira and down through Grau Roig towards Soldeu, Canillo, Encamp and Spain on the right. Use the link below to check out the Grandvalira website. It's packed with info, weather etc. Grandvalira is the name of the company that was formed to run the combined ski areas. (formerly E.N.S.I.S.A). As I mentioned above, they have an excellent web site full of stats, weather, info, piste maps and the like. Have a look (link to the left) it is really interesting. Click above to launch the interactive map.